1947 was the year it all happened – the Roswell crash in New Mexico and the Kenneth Arnold sighting in Washington which gave rise to the term “flying saucer,” both occurred within two weeks of one another. The UFO phenomenon was born. It zoomed into the public consciousness and dominated newspaper headlines. As guardians of the nation’s air space, which apparently was being penetrated at will by craft of unknown origin, people naturally turned to the Air Force. Military spokesmen found themselves being bombarded with questions from aggrieved journalists and anxious members of the public. In response, the Air Force commissioned the first in a series of formal investigations of the UFO phenomenon. 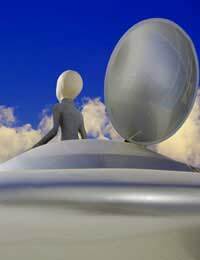 Under the label of Project Sign, sometimes also known as Project Saucer, it concluded that UFOs were extra-terrestrial vehicles. When the project’s final report was sent to General Hoyt Vandenberg, the Air Force Chief of Staff, he promptly ordered it destroyed. Another investigation was commissioned under the name of Project Grudge. Grudge took a different tack and tended to disparage every sighting report, and offer up some conventional explanation instead. Grudge was wound up when a new wave of UFO sightings in late 1951 sparked some genuine interest among the military top brass. It was decided that a really serious investigation was now in order. In 1952, Project Blue Book was born. In a book he later wrote about his experiences, The Report on Flying Saucers, he recalled a change in attitude among the higher-ups about the phenomenon. From considering the possibility that the UFOs might be real, the military moved towards a more hardline position that there was nothing of substance there: apparent UFOs, they insisted, usually had conventional explanations such as meteors, weather balloons, ball lightning, etc. Ruppelt’s staff was reduced to only two, and his budget was cut. He soon asked for re-assignment. After Ruppelt’s tenure, Blue Book continued for sixteen more years. But its approach became increasingly dismissive. The number of sightings classified as “unidentified” reduced dramatically, and it appeared that Blue book staff had been given instructions to bend over backwards to come up with an explanation of any UFO sighting report that came in, however strained or absurd it might seem. As the sixties rolled on, Project Blue book increasingly earned the scorn of UFO researchers, newspaper reporters willing to take the subject seriously, and even its own scientist, J. Allen Hynek. Many felt that a cover-up was being perpetrated and that Blue Book was now more of a propaganda agency rather than an investigative organisation. The Air Force wound up Project Blue Book in 1969. In total, 12,618 sightings had been reported to Project Blue Book and 718 were classed as “unidentified.” Despite this, the Air Force concluded that there was no evidence that UFOs represented any threat to the United States, embodied a state of scientific knowledge more advanced than our own, or were vehicles of extra-terrestrial origin. Project Blue Book’s Chief Scientist was J. Allen Hynek, an esteemed professor of astronomy from the University of Chicago. Hynek had initially been skeptical about UFOs, but as his investigations proceeded, his skepticism waned. It simply could not hold up against the accumulating quantity of evidence. In the end, Hynek became a firm believer that there was an underlying reality to the UFO mystery. When Project Blue Book wound up, Hynek’s interest in the UFO subject continued. In 1973 he founded the Centre for UFO Studies in Chicago in an attempt to put the study of the UFO phenomenon on a more serious, scientific footing. Today the Project Blue Book Archives are available to the general public. You can download reports as PDF files and peruse them at your leisure.The Report on Flying Saucers, a book written by Captain Edward J. Ruppelt, the first director of Project Blue Book, can be downloaded for free from the Gutenberg Project website. Although for much of its life, Project Blue Book was little more than a propaganda outfit aimed at debunking UFOs, paradoxically; the very inadequacy of its explanations persuaded some that there must be a deeper truth to the UFO mystery - one the military was covering up. This brought investigators like J. Allen Hynek into the field of UFO research more fully, where, in time, they were to make distinguished and significant contributions to our knowledge.